We all know some outstanding teachers; BP would like to recognize them with the BP Teachers of Excellence Program. To nominate your favorite teacher, please go to www.bpteachers.com and fill out the recommendation form. To be considered, nominations must be received no later than February 15, 2013. More information can be found on the KPBSD website at: http://bit.ly/BPteachersOfExcellence. If you have questions, please contact Lassie Nelson at 714-8838. KENAI (May 4, 2012) – Mr. Sean Campbell, teacher from Homer High School, was named Kenai Peninsula BP Teacher of the Year at the 17th Annual BP Teachers of Excellence awards. Sean Campbell, who teaches English and language arts, will receive a $1,500 scholarship for continuing education. 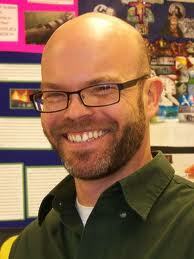 He is among more than 30 Alaska teachers honored as a BP Teacher of Excellence. The BP Teachers of Excellence program was expanded this year and opened to all Alaska school districts. The statewide program attracted more than 1,400 nominations. Some changes have been made to better organize our site. Please use the upper black bar to locate additional on-line resources.